Tribù is an award-winning Belgian brand, although we’re hazarding a guess that their latest designs weren’t actually shot in Belgium but slightly further south – azure blue pools and verdant olive trees are not, as far as we know, a natural Poirot backdrop. 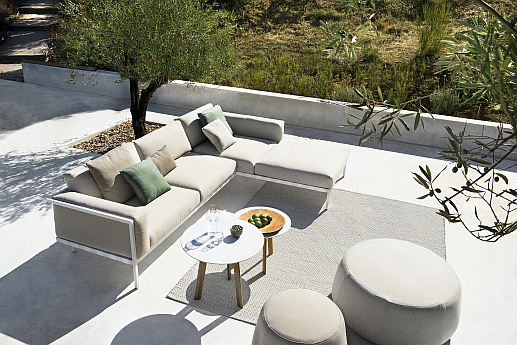 Belgium has pretty much the same weather as we do, so Tribù knows what it’s doing when it comes to designing outdoor furniture that’s completely weatherproof. Their uber contemporary design will withstand anything the outer edges of the Northern hemisphere decides to throw at it – and given our average British summer who knows what that might be. If you’re keen to get in on the ‘bring the indoors out’ trend (and who isn’t…) and create that coveted extra garden room/extension to the house, then this is the answer. Tribù’s fabrics are all extremely hard wearing and waterproof, and resistant to all those pesky outdoor weather hazards: mildew, rot, UV fading etc. Frames are also built with clever, hidden ‘water channels’ (a clever Poirot touch, n’est-ce pas?) and coated with special extra resilient finishes. The other winning feature as far as we’re concerned is that all of Tribù’s designs look as though they could happily sit in the most stylish of sitting rooms. Sleek, contemporary shapes, soft-to-the-touch fabric and clever finishing touches like the Ile side tables and Nomad poufs you can see in the picture above. Planning a little alfresco dining? Tribù’s Vis à Vis dining table, above, is designed by the renowned Piergiorgio Cazzaniga and we guarantee it will induce serious table envy amongst friends. 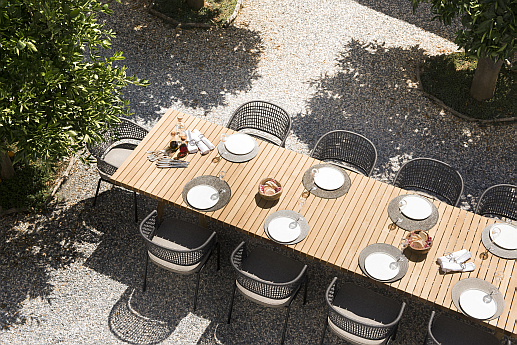 Rather than one large table top it’s cleverly made using individual square-shaped slats (perfect for water drainage) which can then be locked together to form 99cm x 99cm sections to create whatever size table you need – even as large as a whopping seven metres long. We’ll be looking out for our invitation to that party! It’s also made from beautiful East Java sustainable teak, so it ticks all our environmentally-friendly boxes, and it’s hand-picked to ensure the best quality. 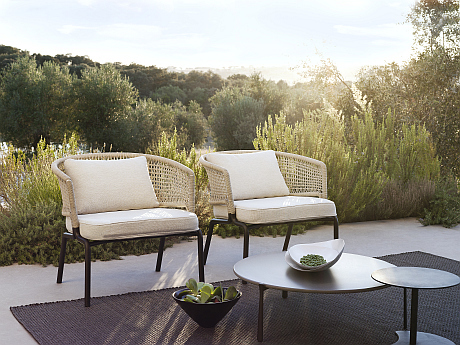 There’s just one thing missing from the picture of the Contour garden club chairs – it’s crying out for that glass of crisp, cold white wine at the end of a lovely summer’s day. Or is that just us? Luxuriously comfortable armchairs with lots of space to sit back and relax. The woven backrests are incredibly supportive and made from plaited Tricord, a totally weatherproof material, which means that, as with all of Tribù’s furniture, you don’t constantly have to have one eye on the weather forecast. They’re happy to sit on the terrace doing their own thing all year round. Bit like most of us really. And there’s some beautiful soothing colours to choose from like linen and wenge and you can also include the optional back cushions. This is probably our favourite shot… no idea where it was taken (if you’re keen to know, let us know and we’ll have a word for you). What’s not to like? 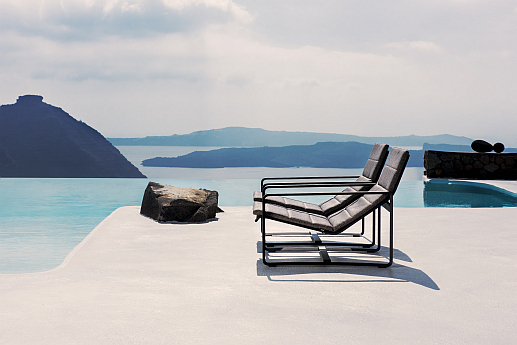 Shimmering blue skies, sparkling blue sea, a little heat haze – oh, and the striking Neutra chairs. Looks like something from a Warhol picture doesn’t it. Tribù describes Neutra as having ‘elegance and simplicity’ and we love the triangular profile designer Vincent Van Duysen has created. They’re die-cast using an extremely high-pressure technique which results in a seamless, weldless frame that gives the illusion of an extra thin line totally belying how comfortable they really are. We want to say “roll on summer” but of course we don’t have to! Check out all of Go Modern’s outdoor garden furniture designs here.